We know how important it is to have as much choice as possible when transforming your home, which is why we have the biggest windows and doors showroom in the East Midlands. Our huge selection of products allows you to take a look at and get a real feel for what would best suit your home, personal style and family needs. 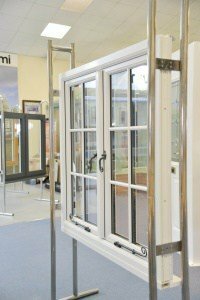 Take a look at our display at our window showroom, including our PVCu casement, sliding sash, bay & bow and tilt & turn windows, some of which you can open and close using the array of hardware we have fitted on them. We also have an awe-inspiring dedicated Lumi stand, where our frame-less windows are displayed along with handy information about the unique product. We also have our glass options on display if you’d like a window that offers a bit more privacy. We have the biggest choice of composite doors in Derby. 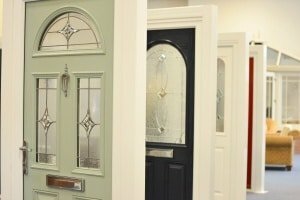 At our showroom, you can find around composite doors in a range of styles, all in dual colours to give you as much choice as possible. We also have a row of around 10 classic white PVCu front doors in a selection of styles. We have a state of the art Spitfire aluminium door stand in our showroom, which gives you an idea of just how impressive the doors are. We can even give you a demonstration of the thumbprint key activation! Lastly, you can find our Lumi doors on our Lumi stand and see for yourselves just how impressive the frame-less doors are. You can open and close all of the entrance doors in our showroom, so you can walk through and imagine that they are leading the way into your home. 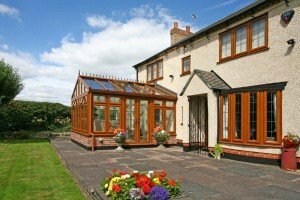 When deciding on how to add space and light to your home, what better way to make your choice than to see just how spacious and illuminating a conservatory, extension or kitchen can be? 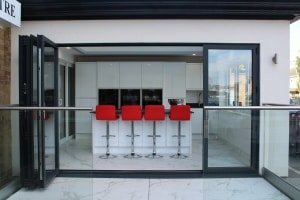 We have five conservatories and three kitchens on display in our windows and doors showroom. There’s also a solid roof conservatory too, using the Equinox roof system, which can be used for new conservatories or refurbishments of old conservatories. You can wander into them and really get a feel for how much fresh air they will breathe into your home, and the finishing touches we’ve added means you can picture you and your family making memories in them. Just so you can see, one of our conservatories is decorated as a dining room, another as a lounge, and another as a kitchen. Out of our three kitchens, the rear kitchen has been completed with French doors, the middle with aluminium bifold doors, while the kitchen extension at the front is completed with aluminium bifold doors, a Skypod roof lantern and a glazed balustrade. 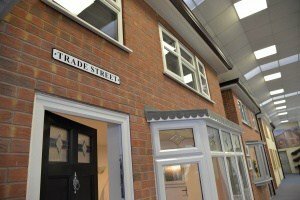 If it’s a whole house transformation you’re after, Trade Street is the place for you. We have a row of three full-sized brick houses complete with windows, doors and roofline, which you can walk into, so you’ll know exactly what our products are like in a real house setting. This way, as well as being able to see what our windows look like on the outside, you can see what they look like on the inside too, adding light and style to any home. With products like roofline, it’s best to see them on a real house to see what colours you like best and to see just how seamless they are. With Trade Street you can do just that. 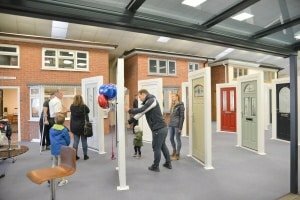 As with our full entrance door display, on Trade Street you can walk in and out of our front doors, but also see what they will look like on real houses, making an entrance into a real home. You can find all of this and more at our windows and doors showroom on London Road, Derby. Don’t forget, each product shown in our showroom comes with lots of design choices, including a huge range of style, colour, glass and hardware options. As well as our huge range of products and stunning displays, we have a team made up of home improvement experts who are passionate about transforming homes. You can visit us seven days a week. We’re open Monday to Friday 10am – 6pm, Saturday 10am – 3pm and Sunday 10am – 2pm. To find more pictures of our showroom and to keep up to date with our latest news, Like our Facebook page. 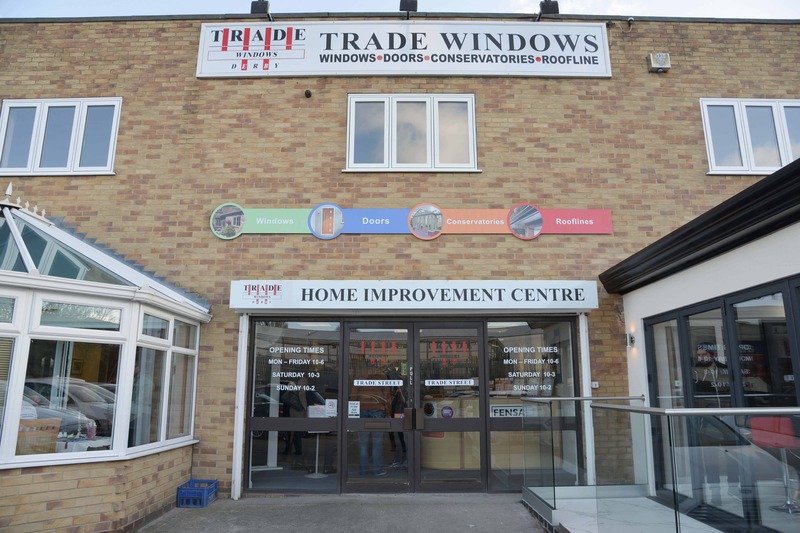 To book an appointment or find out more about how we can help you, call Trade Windows on 01332 755551.